Most are aware that my hobby is terminal performance testing of bullets with a favoritism to 6.8mm/.277 caliber. As a result, I have a pretty largest collection of 6.8mm bullets. However, it is not a large quantity of bullets as most bullet types are just a handful left over/unused from terminal performance testing. So, what good can one do with a collage of bullet types when only a few of each type remain? While reorganizing the workbench last fall, the answer presented itself – use them to determine ballistic coefficients (BCs). There were several bullets without published BCs plus I was wary of some manufacturers’ advertised BCs. The plan was to achieve a sample size of four bullets fired through a chronograph at the firing line and a second chronograph at 200 yards simultaneously (plus time-of-flight) and analyze velocity decay to derive their BC. This endeavor turned out to be one of the more challenging testing I have accomplished and often consumed an entire day at the range. Reams of data have been collected during 10 range sessions since last October and I stopped counting the number of bullets sent down range after passing 500. You may say a sample size of 4 is insufficient to derive an accurate BC value but I quickly found that the quality bullets we have today are very consistent in their velocity decay with most under 0.5% variation. Even just testing one or two bullets can give you better than “ball park” results if the velocity and environmental data collected are accurate. 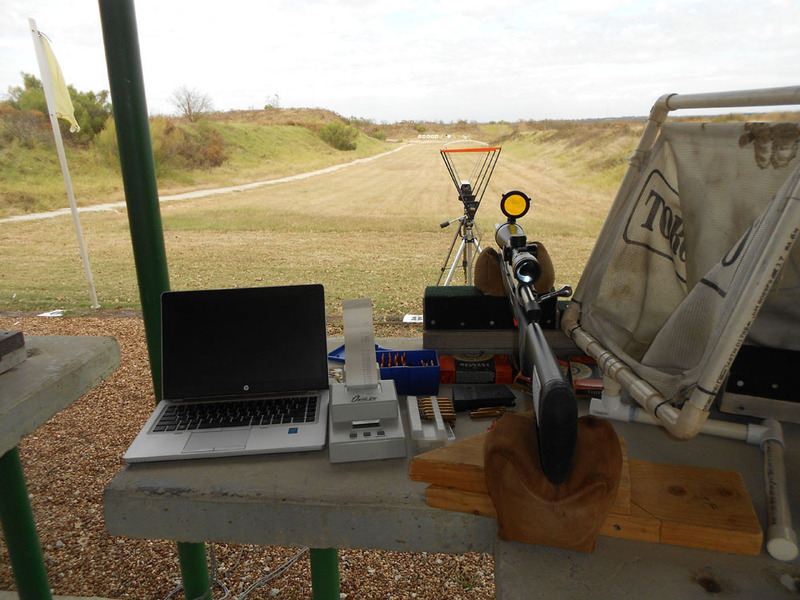 This was a learning experience and the testing process matured at each range session. Since there were no bullet resources for load development or sight-in, a technique was devised to mitigate sighting errors. 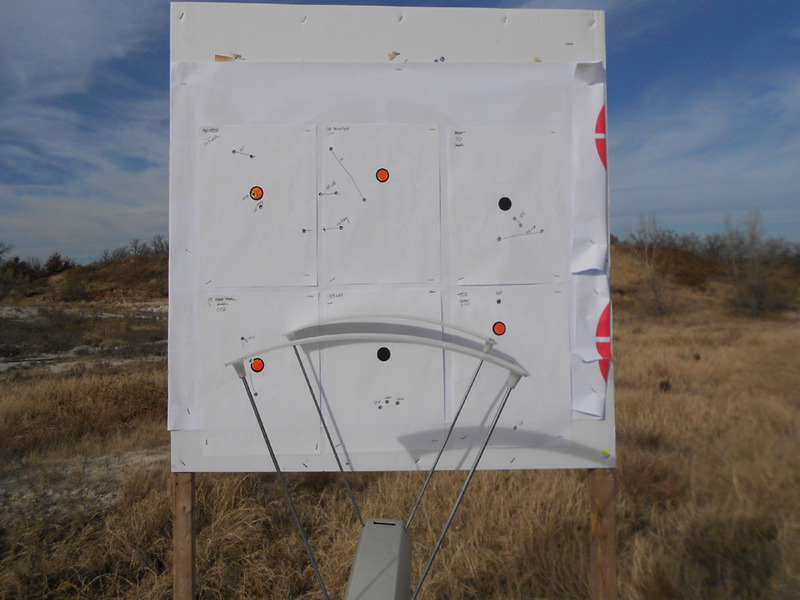 Multiple 8.5” x 11” sheet of paper with 1” dots for point of aim (POA) were stapled on a target board at 200 yards. The first step was to fire two shots of each bullet type onto its respective/labeled piece of paper to establish point of impact (POI) for that specific bullet type and load. During this step, the two chronographs, an Oehler and a ProChrono, were placed in-line 12 and 15 feet from the bench to allow verification of chronograph readings. Their recorded velocities were typically within 5 to 10 feet per second of each other. To help make sure the right bullets went on the correct paper, orange dots were for 6.8mm rounds and black for those shot from the .270 Win. In some cases, more than one type bullet was shot at a paper to establish POIs. With POIs established, the less expensive ProChrono (but no less accurate) was then moved down-range to 200 yards and placed in front of the target board at the bottom center. After firing the appropriate bullet types at the bottom-center sheet’s POA, the next bullet type/load was then set-up to fire through the chronograph by removing the appropriate sheet, repositioning, and then restapling it so the mean POI was centered in the heart of the sensor pattern (shades) behind the chronograph. Velocities were individually recorded at the line. After firing all the bullets loaded of that type at the POA (black or orange dot), velocity data was then recovered from the 200-yard chronograph and the next bullet’s POI was centered and restapled behind the chronograph. This process was repeated for the number of bullet types loaded for that range session, often over 20 different bullet loads. Riding a bike back and forth to the 200-yard line made the process move quicker. BTW, it is not recommended that you shoot through your chronograph at any distance other than at the firing line. If you do as I did, it is at your own risk. Posted: Thu Jun 15, 2017 7:52 pm Post subject: Why 200 Yards? Collecting down-range velocity at 200 yards was chosen because my 6.8mm AR and .270 Tikka rifles, even with no load development, typically group 2 moa or less which would keep the bullets’ POIs within the heart of chronograph’s light sensors. A greater distance would have increased group size, wind affects, test time, and the risk of hitting the chronograph. Note, after a couple range sessions, the metal shade rods were replaced with wooden dowels as a precaution in case a bullet strayed too far from center. It would have been a lot easier to do this test at 100 yards but I’ve always heard that, to get an accurate BC measurement, you have to measure bullet velocity loss over a distance of 300 yards or longer. This is good advice if you want the derived BC (G1 or G7) to better represent the average BC over that distance/range of trajectory calculations. However, it doesn’t make the BC more accurate. I found if velocity can be precisely measured, an accurate BC value can be determined after just a few yards of bullet travel. Note, bullet G1 BC values can vary with velocity decay. This was evident with several bullets where BCs increased as velocity decreased. When available, you are better served using a G7 BC if you plan on shooting long range. 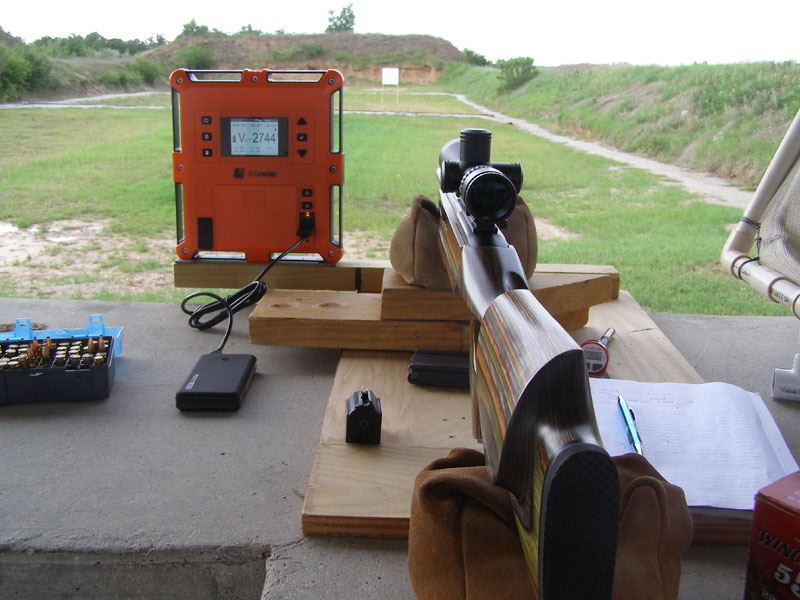 The BCs were derived by inputting the muzzle velocity and environmental parameters into an on-line BC calculator and changing the ballistic coefficient variable until the calculated down-range velocity matched the measured data. Multiple methods of deriving the BC value were investigated, including doing an analysis for each individual bullet. It ultimately was found that deriving a single BC value from the average velocities matched or was within a couple thousands of doing each bullet’s BC individually and then averaging them – and saved a lot of time doing the analysis. Several on-line calculators were considered. Their input variables were not all the same and they returned slightly different BC values for the same given conditions. The JBM’s Trajectory Calculator (link below) was chosen because it had the common inputs for Barometric Pressure, Temperature, Wind, and Humidity, plus allowed inputs for Terrain Elevation and the Distance at which the muzzle velocity reading was taken, e.g., the chronograph was at 12 feet. These last two factors are important because the distance to the chronograph does affect the resulting BC. I also need to be able to determine what my trajectories are at higher elevation for hunting in Colorado, New Mexico, and Wyoming. Example, at 8,500 feet elevation, a .270 Win load has the same velocity/energy at 400 yards as it would at 300 yards at sea level. As a bonus, the JBM Trajectory Calculator also outputs lead distance for an animal on the run for all you hog hunters. It turned out that a critical part of determining BC is getting the environmentals right. It is relatively easy to accurately measure the speed of the bullet downrange if you are willing to risk a chronograph. It is the environmental factors, e.g., barometric pressure, temperature, humidity, and wind that also have to be correctly measured to derive an accurate BC value. If these parameters are off, the derived BC will not be accurate. Without a high-end Kestrel Weather Meter, I had to rely on the nearest weather station. Initially, the BC testing was conducted at two different ranges but the results were significantly different. It was determined that the weather station next to one of the ranges was not reliable and velocity data taken at that range had to be discard. The other range has been consistent and remains the sole location used for testing. Still, the weather station being used is 13 miles away so there can be some variation from the actual environmentals at the range’s location. I have an accurate way to measure air temperature but still have to rely on the weather station for barometric pressure and humidity plus I use the weather station’s data to check wind estimates. I have found over 10 test sessions that the derived BCs typically vary as much as 0.010 (3-4%) either way from an average. This variation is suspected to be mostly caused by environmentals not being spot on for that range period. Thus, the BC result for a bullet tested during one or two range sessions could be off some. In situations where I tested a particular bullet multiple times, the average appeared to be accurate. Posted: Thu Jun 15, 2017 7:54 pm Post subject: Accurate? What is Truth? But accurate compared to what? Are the advertised BC from the manufactures go to go? For “truth”, results were compared to the BCs listed by the Applied Ballistics Calculator in its bullet drop-down menu. If available, their values were included in the Results Table below. As an example, Applied Ballistics lists the BC (G1) for the Hornady 110 BTHP at 0.353 (advertised 0.360). The data collected from these tests resulted in an average BC of 0.355 (G1). Note, the BTHP was tested at most of the range session as a control. You can see that other BC results were also close to Applied Ballistics’s values. Sierra’s .224 69gr and 77gr SMKs were tested during a single range session and their derived BCs were 0.002 higher and 0.006 lower compared to Applied Ballistics values, respectively. 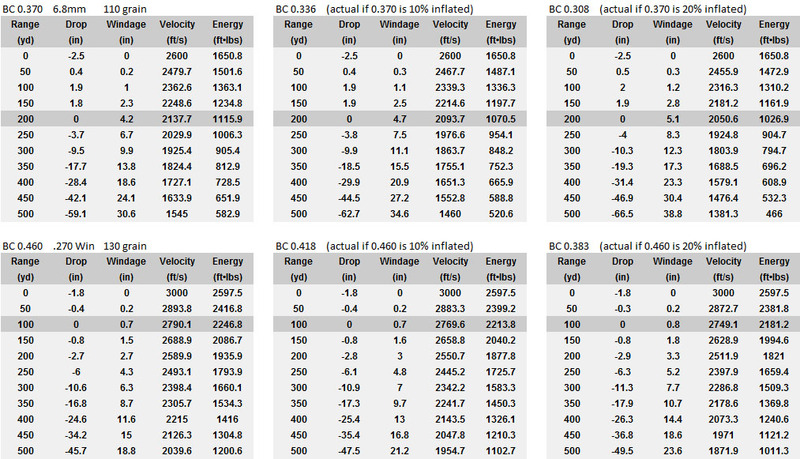 For some bullets, the derived BCs were significantly higher and some lower. Applied Ballistics lists the Barnes 130 TTSX at 0.373 and these results averaged 0.412 after multiple tests. Barnes has changed some of their bullet ogives recently and I could have been testing an updated bullet. For the Berger 130 VLD, Applied Ballistics list the G1 BC as 0.461 and I'm measuring an average of 0.444. That difference may be due to a velocity and or twist rate difference because the 130 VLD was tested in a 6.8mm instead of a .270 Win. Note, testing data published by accurateshooter.com showed that "BC drops by about 3% for every 0.1 that SG (stability factor) falls below 1.5." After reading this report, the 130 VLD was tested from the .270 with 1:10 twist resulting in a BC of 0.462. The table below shows the Ballistic Coefficient Test results to date. They are organized by manufacturer showing their advertised BC first, the % it is inflated, and the BC results of this testing. Most shooters would agree that today’s ammunition market is ballistic coefficient driven and there is competition to make bullets with the highest BC possible. Up front, I will tell you that these results point to Barnes, Berger, Hornady, and Sierra as advertising credible BC information. There may still be a little fudging going on. I had the chance to talk with Dave Emary at Hornady when the then new .277 130 GMX was introduced. He was frustrated that marketing listed the 130 GMX’s BC as 0.460 when they had measured 0.453, 2% above actual. You may have also notice Hornady’s picture posted of the 6.8mm 100 GMX which shows a boat-tail even though it has a flat-base (hmmm, the 100 GMX competes with the 95 TTSX which has a boat-tail). In the other corner, however, these results show the BCs advertised by Nosler, Federal, and Speer are typically inflated, some bullets by more than 25%. Since it is not that difficult for a major company with resources to figure out actual BCs and these are competent companies, one could conclude they list inflated BCs for marketing purposes and to improve sales. An example is the 115gr Fusion MSR which Federal advertises a BC (G1) of 0.378. The average of multiple test found the 115’s BC is 0.301. Would some of you hesitate to pick up a box of 115 Fusion MSRs if Federal advertised the lower but actual BC? Extra rounds of 115 Fusion MSR were obtained to accomplish retesting and triple checking this particular BC value. The effects on BCs when a hunting bullet is modified were also explored. Select bullets had their BCs measured with and without their ballistic tips and some hollow-points were modified to add a ballistic tip. No surprise here, the ballistic tip wins the BC challenge. But this isn’t totally fair because a hunting bullet with a ballistic tip has to have a larger expansion cavity/hollow point behind the tip to promote expansion. Thus the BC of a bullet designed from the beginning not to have a ballistic tip typically isn’t as low as a tipped-bullet with its tip removed. Another reason the BC difference isn’t as great between a tipped and non-tipped hunting bullet is the larger expansion cavity behind the ballistic tip can reduce the bullet’s weight by 10 or more grains. To measure the effects of weight on a bullet’s BC, some all-copper bullets were lightened by machining out the back of the bullet. Weight could also be increased by filling the void with melted lead. 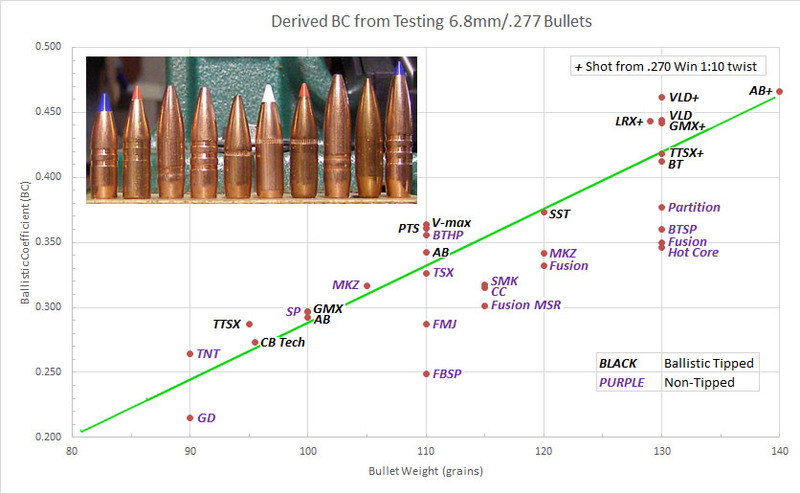 The experimenting is not in the data presented but illustrated just how sensitive BC is to a bullet’s weight. If two bullets have identical shapes but one is made out of copper and the other has a lead-core, the lead-core bullet will have a higher BC just because it is heavier and has more inertia. Thus, a monolithic copper bullet will not match the BC of a similar shaped lead-core bullet. This should make sense. If you take two balls the same shape and size, one a hollow plastic shell and the other a heavier hardball, which ball will retain its velocity and go the farthest when you throw it? To show the increasing BC trend with increased bullet weight, a green trend line was included on the Bullet Weight vs BC Graph below. Its position on the graph is not significant. At its current location, the 100, 110, and 140 Accubonds (ABs), all bullets with similar design, line up fairly well. The green line could also have been moved lower and the 90 GD, 115, 120, and 130 Fusions would have been along the trend line though not as close due to differences in ogive and flat-base vs boat-tail. So, ask yourself these questions. How important is an accurate BC? So what if a manufacturer inflates their advertised BCs to keep their bullets and ammo selling in a competitive market? To help with the answers, below are trajectory calculations of a generic 110 grain bullet for the 6.8mm SPC and 130 grain bullet for the .270 Win based on three different BCs. To stay “competitive”, it appears the 110 grain 6.8mm bullet needs an advertised BC of 0.370 and the 130 grain bullet an advertised BC of 0.460. 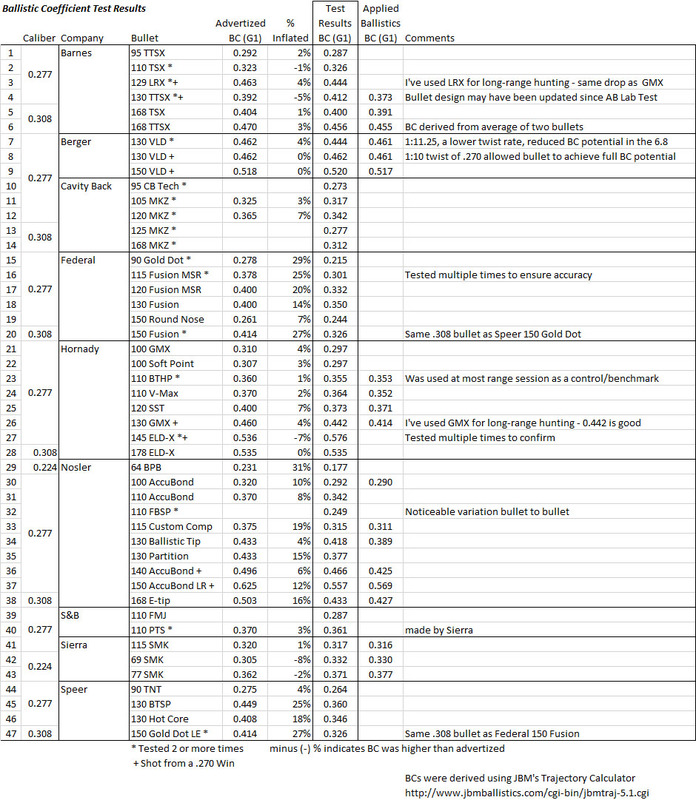 The comparisons shows what the performance difference is if the advertised BCs were inflated 10% and 20% above actual (0.370, 0.336, 0.308 and 0.460, 0418, 0.383, respectively). For the 6.8, I zero at 200-yard and use hold-over out to 300 yards. For the .270, I use a 100-yard zero with a bullet drop compensation reticle out to 600 yards. Differences in velocity, kinetic energy, trajectory drop, and wind drift are shown in the table below for you to compare. To be honest, I expected to see a more significant difference since BC has become such a hot item. I’ve been lead to believe that even 10 points of BC was worth considering. My conclusion – it is more important to choose a hunting bullet that is accurate in your rifle and has effective terminal performance than to worry about the BC. The velocity difference if a BC is inflated by 10% can be less than the variation from a powder’s sensitivity to temperature changes. Regardless of what the trajectory calculation are from the muzzle velocity and BC inputs, a shooter should always verify and practice with their rifle and hunting load out to the max range they establish for their personal hunting limits. If you want to trust the ballistic card output from your favorite trajectory calculator, nothing builds confidence more than verifying with actual results at those distances. This experience motivated me to obtain a LabRadar chronograph which can track and measure .277 bullet velocities and distances out to around 75 yards; .224 bullets a little less and .308 bullets a bit further. Boat-tail and flat-base makes a difference, also. This Doppler radar unit measures velocity and distance with precision every thousandth of a second which equates to a velocity measurement taken approximately every 3 feet of travel. This unit was used for the last few range sessions and collection of all .224 and .308 bullet velocity data. The LabRadar’s velocity accuracy is within 0.01% (2.5 fps) compared to 0.1% of a typical optical unit (25 fps). As an example of its accuracy, I was doing a terminal performance test with the bullet trap set up in-front of a berm that was 15 yards behind the 100-yard line. I typically use an estimate of 112.5 yards for velocity and energy calculations when doing a test on this range. The LabRadar reported velocity every yard until it lost track of the bullet at 113 yards when the bullet entered the trap. This Doppler radar unit also has the advantage of not relying on sunlight and even works in the rain which can extend effective range time. Set-up is also a breeze. No more waiting for the line to go “cold” and positioning the chrony in-line with the bench and target. Just point the LabRadar down-range and start shooting. With this unit, collection of down-range velocity data has certainly been made easier as well as more accurate. If there is a down-side, it would be that the derived BC is more velocity specific (like Sierra posts the BCs by velocity range for their bullets) and not an average BC value derived over a wider range of velocity decay. To compensate, I may need to include some low velocity loads out of the .270 (the 1:10 twist is needed for bullet stability at slower speeds). Time will tell. Are you a frustrated ballistics PHD by any chance? No, just got the bug in me to go do this. Then it became captivating the more I did it especially when I found how much some of the manufacturers were inflating their BC values. Are you correcting the BCs for standard conditions or just under the conditions at the time? Seriously, a lot of time and effort (and money) went into this and it provides a great deal of value for the shooting community. PaulS, I didn't find anything that indicated BC values are normalized for standard conditions. Do you have any information that shows BC is anything other than an independent coefficient that remains constant? As the environmentals change (Barometric pressure, temperature, humidity, winds, elevation, etc) significant velocity and trajectory variations occur, but the BC remains a constant.